This article is mainly based on the investigations made by the investigative journalist Erkan Metin and the two TV interviews made with him by Assyria TV about the two Orthodox bishops Yuhanna Ibrahim and Paul Yazici, which have been kidnapped outside of Aleppo, Syria. 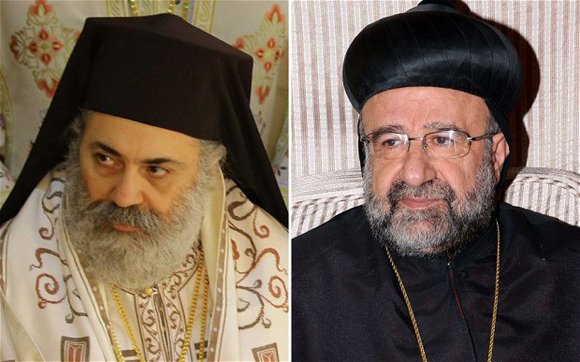 On April 22nd, 2013 the two bishops Yuhanna Ibrahim and Paul Yazici where kidnapped. During the kidnapping their driver was murdered, but there was a fourth person in the car with the bishops who was released, Fuad Eliya. Since then the bishops’ fate is unknown. Bishop Yuhanna Ibrahim belongs to the Syriac Orthodox Church and was considered as the strongest candidate to take over the patriarchal duties for the Syriac Othodox church, after the present patriarch. Bishop Paul Yazici belongs to the Greek Orthodox Church and is the brother of the patriarch of the same church. On April 22nd the bishops Paul Yazici and Yuhanna Ibrahim left the Turkish border, heading towards Aleppo. In the silver coloured car of model Kia Sorrento was also Fuad Eliya and bishop Yuhanna Ibrahim´s driver Fathallah Kabud. Bishop Paul Yazici was on his way home to Aleppo after an overseas trip. To get home safe to Syria he asked Bishop Yuhanna Ibrahim to pick him up by the border post Bab El-Hawa to Turkey. After 20 kilometres of driving the car was stopped by a roadblock that was controlled by the FSA, Free Syrian Army. The bishops car passed the roadblock without any problem. But a couple of kilometres away from the roadblock at 3:45 pm, the car was stopped by eight heavily armed men. According to Fuad Eliya, who was the only survivor from the kidnapping, the perpetrators were not Syrians, but seemed to be people who came from Caucasus, Chechens. Their clothes were similar to the Talibans. One of the kidnappers forced the driver out of the car and put himself behind the wheel, another armed man sat in the backseat of the car and they drove behind the kidnappers’ blue truck. The cars changed direction and drove back to Bab El- Hawa. This is where all the traces of the bishops end. Since the war broke out in Syria, Turkey has played an active role in the conflict. The Syrian opposition´s headquarters are in Istanbul. The Free Syrian Army, FSA, runs its operations virtually from refugee camps in Turkey that are placed along the Syrian border. Qatar, Saudi Arabia and Turkey have since the conflict started been standing by the Syrian opposition’s side. The countries have helped the opposition with logistics and weapons. But Turkey has played an ever more active role and has successively increased the weapon deliveries to the opposition. Even the more radical groups, such as Al-Nusra and many more which are associated with Al Qaeda, have received weapons from Turkey. The chaos in Syria has attracted jihadist groups from a lot of countries in the region. The 900 kilometre long border between Turkey and Syria has been a hallway for the jihadist groups, where they have been able to get into Syria. Turkey has deliberately closed it’s eyes and harboured these jihadists. In the Syrian civil war, Russia has supported the regime. Russia´s support has brought reactions from the Muslims in the Caucasus region, which have been drawn to the Jihad in Syria. The jihadists from Caucasus have two reasons to engage in the “holy war” in Syria; to help their Sunni co-religionists and to revenge on Russia, which according to these jihadists has been oppressing them in the Caucasus. But these jihadist groups have rarely participated in any real battles, instead they prefer to amuse themselves by plundering and murdering innocent civilians. Often they commit war crimes and crimes against humanity. This propaganda video is only one of many examples showing how brutally these terrorists act. Those who watch the video can see that these terrorists are from the Russian Caucasus. The “holy war”, Jihad, has united many extremists from Chechnya, Dagestan, Azerbaijan, Turkey, the Balkans and many other Muslim groups. These have unhindered been able to move inside Turkey, along the Syrian border. A truck loaded with armour-piercing rockets was stopped outside Adana close to the Syrian border. It was heading to the rebels in Syria but was caught at the police control. As recently as the first days of 2014 another truck was stopped in Hatay, also headed to Syria. A roadblock stopped the truck which was controlled by the police, which wanted to search thru the cargo. The searching was stopped by the Turkish secret service, MIT, which escorted the truck. According to the Turkish ministry of interior, the load consisted of clothes, medicine and other emergency care for Turkmens in Syria. But the question is why a load of “emergency care” is being escorted by Turkish secret agents, which are directly subordinated to Prime Minister Erdogan, remains unanswered. A couple of days later the Turkmens organizations denied that they had received any emergency care from Turkey. The scandal is a fact. After having been revealed several times with similar events, there is no doubt that Turkey is sending weapons to radical groups in Syria. As a result of Turkey´s involvement and to the active support for the extremist groups, eleven Syrian civil opposition organizations decided to take Turkey to the court for Human Rights in Europe. The extremist group which consists of many different ethnicities from Caucasus was founded in 2006 under the name “Caucasus Emirate” during the Chechen war against Russia. This Caucasian mobilization is now in Syria also. The warriors/terrorists from Caucasus excel in their brutality. Abu Omar the Chechen, who founded the Hattab brigade made himself a name in a short time. Several small groups that came from Caucasus announced their allegiance to Abu Omar the Chechen. In Syria these groups were called “the Turkish brothers”. The Caucasus Emirate has under periods of times been allied with the Free Syrian Army, and sometimes also with Al Qaeda. Lately the group has joined ISIS, Islamic State in Iraq and Syria. Jihadist groups which are terrorising the population of Syria along the Turkish border are well known by Turkey. These jihadists are provided with weapons and communications equipment such as walky-talkies by the Turkish secret service MIT. One of these jihadist groups is being lead by Abu Ömer el-Kuwaiti who controls his operations in the Aleppo area from the Turkish border city of Antakya. Abu Ömer el-Kuwaiti is being assisted by a person from Dagestan by the name of Magomed Abdurrakhmanov who uses the code name “Abu Banat” (in Turkish; Ebu Benat). It is this person who is suspected to have kidnapped the bishops Paul Yazici and Yuhanna Ibrahim. According to the latest information about this matter, everything points to the fact that it is Abu Banat who has kidnapped the bishops, but we will return to that. During the summer of 2013 a video clip appeared on YouTube were a person cuts off the heads of three people in a brutal way. Several persons in the video and he who performs the decapitation speak Russian. You can also hear a Turkish voice that says “sit down, sit down” so that they have a clearer view of the slaughter. The person who is performing the decapitation in the video is Magomed Abdulrakhmanov with the codename “Abu Banat”. The brutal slaughter upsets the public in many different places all over the world. Everyone wants to know who this inconsiderate barbarian is. When these horrible pictures appear in the media there are speculations about whom this man is. On several Russian websites and forums, here and here the information about Abu Banats real identity appears. When his identity is disclosed the information about his background spreads. The information says that he was a police officer in Dagestan who later on found his way to Jihad in Syria. In the beginning of 2013 Abu Banat’s group establishes itself close to the village El-Meshed which is only five kilometres away from the border post Bab El-Hawa. It is at this border post where the bishops passed. He marries a women from the village El-Meshed. Abu Banat wants to show his authority through brutality. He terrorises the villagers and murders a villager to set an example. Those who smoke will lose a finger and those who drink alcohol will be punished according to the Sharia Laws. The rumour about Abu Banats brutality spreads to the surroundings. The group engages in raids and terrorising the surrounding. The group’s camp is being noticed more and more and the rumours start to flourish about a “fantasy camp” with lots of weapons, money, valuables and jihadists that are playing PlayStation. The rumour about the group’s raids and brutality reaches the Free Syrian Army, which sends a group of soldiers to control this information. The FSA claims that the group did not participate in the war against the Syrian regime but exclusively dedicates to looting. A conflict occurs between the FSA and Abu Banat’s group which results in the group being dissolved. Abu Banat is detained in Istanbul. April 23rd 2013, by a routine control, the police stopped a car outside the city of Konya. In the car they found a Syrian woman and three other persons with Chechen origin. All were missing valid ID documents. The magazine Radikal wrote about this event with the headlines: Orthodox bishops murderer arrested in Konya. The magazine also wrote that because these persons did not have any valid ID document they were deported to their respective countries. But the truth is totally different. The police released everyone after they received a residential address in a suburb of Istanbul where the group lives. With the fresh memory of the brutal decapitation video one of the police officers recognizes one of the persons that is in the car. He reports to the police in Istanbul about the suspicions against the group. When the event intercepts from a police report by the local magazine in Konya the news spreads in Turkey. Several magazines write that the bishops’ murderer was arrested in Konya. When the police made a foray into the indicated address they found weapons and grenades. The group was arrested for violation of the Arms Act and preparation for terrorist attacks. Since the summer of 2013, the group is in police custody in the Maltepe prison in Istanbul. But when the news about the group that were suspected for the kidnapping of the bishops spread, the authorities stated that the group had been deported. Why was this stated when in reality the persons where in police custody in Istanbul? We found the answer to this after we got access to the police investigation in the end of December 2013. According to the police investigation Abu Banat is known by the Turkish secret service MIT and has been given equipment from them. When the news about the arrest of the suspected bishop murderer spreads in Turkey, the Syriac Orthodox Church’s representatives such as bishop Yusuf Cetin in Istanbul, contacts the Turkish government. Secretary of State Ahmet Davutoglu has earlier commented this event at several occasions. On a meeting with the Syriac Orthodox Church´s bishops, Davutoglu said that he had received intelligence information that the bishops were still alive and that Turkey is doing everything to save the bishops Yazici and Ibrahim. Secretary of State Davutoglu has given the impression that they have a clue about who the kidnappers are. The Prime Minister Tayyip Erdogan also gave similar statements when he visited Stockholm and met the Assyrians’ representatives at Grand Hotel in the beginning of November 2013. As late as last Christmas the Turkish former attorney general Sadullah Ergin said to the Greek Orthodox Church in Hatay that the government is working on saving the bishops. These and many more statements have been given by Turkish officials in spite of the fact that the bishops suspected murderer was in police custody in Istanbul. All indications point to the fact that Turkey had a hand in the bishops’ kidnapping and has therefore done everything to hide the truth about the suspected murderer. Why would Turkish government officials lie otherwise? On September 29th the investigative journalist Erkan Metin published a long article on www.suryaniler.com. During three intensive weeks Erkan Metin was investigating the disappearing of the bishops to find clues that would lead him to the truth. The elaborate investigative article with it’s declaration of sources explains the truth about the bishops’ kidnapping. For his investigation he gets in contact with affected persons in Syria and he goes through websites in English, Turkish, Arabic, French and Russian. While investigating, Erkan Metin finds Abu Banats real identity, which is Magomed Abdurkhmanov with his origin in Dagestan. He continues to investigate during the arrest of Abu Banats group. He comes to a clue that indicates that the suspected group might be in custody. Erkan Metin follows this lead and when he controls if there is anyone by the name Magomed Abdurakhmanov in the police custody it turns out to be true. Opposite to all the news magazines and the authorities statements that the group had been deported, Abu Banats group was in police custody at the Meltepe prison in Istanbul. The revealing of the Turkish authorities’ recurring and systematic lies was now a fact. Erkan Metin continues the search for information that can cast some light on the bishops’ kidnapping. Finally he finds unique information that ties Abu Banats group to the kidnapping of the bishops. www.kavakazcenter.com, a website that belongs to the “Caucasus Emirate” writes on July 3rd 2013 with the headlines “Russian footsteps in Syria” that it is the group that is being led by Abu Banat that is behind the kidnapping of the bishops. The website also states that Abu Banat is really a Russian agent. The magazine further writes that according to Kavkazcenter’s sources in Syria, the bishops have been murdered with an explosive belt on their back. (This method is often used by the Talibans in Afghanistan). But how come that Abu Banat who belongs to the Caucasus Emirate is being repelled and blamed for being a Russian agent? – It is me who has decapitated these three persons. It was the first time I decapitated a human. But I don’t understand why these came up on the Internet. It was something we did every Friday after we had sentenced these persons in the Sharia court. And later on I executed the punishment by decapitation. The police make a superficial hearing and avoids going deeper into the events. No questions are being asked about the kidnapping of the bishops. Abu Banat confesses that is was he who decapitated the persons the YouTube video. This link shows the same video from a better angle. Abu Banat’s group may have recorded it. NOTE! Warning for very strong pictures. He says that he has received walkie-talkies from a person by the name Abu-Cahfer from the Turkish secret service. Abu Banat and his companion are injured. This can indicate that these have been injured in a battle with the FSA and fled from Syria. Secret documents which were published publicly during the investigation show that on April 26th 2013, four days after the kidnapping of the bishops Ibrahim and Yazici, the Turkish secret service MIT writes a report to the state department in Ankara. In this report it is in details described how the bishops have been taken and moved between different locations before they ended up in the village Mashad Ruhin (also called el-Meshad) outside Aleppo. This information ties Abu Banat to the kidnapping of the bishops. Since the group is carrying Turkish walkie-talkies, the frequency can be checked by the Turkish secret service MIT, which are mapping their activities and movements carefully. Abu Banat who confesses the decapitation also acknowledges that he has committed both war crimes and crimes against humanity. To be able to press charges against Abu Banat for these crimes, the prosecutor needs to apply for leave to appeal at the ministry of justice. But it is being rejected with the motivation that it is a Syrian inner matter and that Turkey has not taken any damage from this crime. After the revealing that Erkan Metin came out with and after the investigation against Abu Banats group was made public, several media publications have picked up the news about how Turkey is closing it’s eyes for a extremist that demonstrably decapitated numerous people in Syria. Magazines have written about the scandal with headlines such as “To slaughter humans is not a crime” and “Turkey has not taken any damage by the decapitations in Syria”. When the truth about the suspected kidnapper is revealed, that he was in police custody, the Syriac Orthodox Church has chosen not to comment the matter. The bishop in Istanbul, Yusuf Cetin, and the church board have also chosen not to comment the revealings. This could be the classic fear of retaliation by those in power. The Syriac Orthodox Church´s representatives are afraid of the Turkish authorities. The Assyrian parliamentarian Erol Dora from BDP has submitted a written question to the Prime Minister Tayyip Erdogan about Turkeys interference in the kidnapping of the bishops and the country’s relationship to the suspected killer. Continually Erol Dora questions justice minister Bekir Bozdag about how it is that the ministry does not grant the possibility to convict a person who has admitted that he has decapitated people in Syria? Erol Dora, who is also a lawyer, indicates the sections in the Turkish constitution, which state that such crimes do not necessarily have had to occur in Turkey for the perpetrator to be brought to court. It is obvious that Turkey is playing a very dirty game in Syria. It does not shy away from delivering weapons and closing their eyes for Muslim extremists passage to Syria through the Turkish border. Turkey knew about a jihadist group that was led by Abu Banat that had kidnapped the bishops Yuhanna Ibrahim and Paul Yazici. This group also had contact with people from the Turkish secret services MIT and received equipment. According to the Turkish ministry of justice it is totally fine to slaughter humans in Syria as long as it does not affect Turkey. It is this country with this approach to humanity which is talking about bringing democracy to Syria. It is this country with this uncivilised approach to human rights which wants to enter the EU. We want to warn you about the very disturbing images in the video links referred to in this text.